Please assure you corretly type extention as .html or .htm, otherwise browser not consider the file as valid web page. Open the index.html in your favorite browser like Internet Explorer, FireFox etc. HTML code always starts with <body>(open tag) tag and close with </body>(close tag). Between body tag we write our all HTML code. After body tag we type <head> tag and </head> tag. 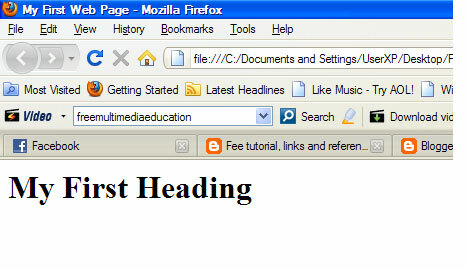 In head tag we write the <title></title> tag for HTML web page. Web page Contains like Text, Images, Links should be written between <body></body> tag.